If nerves are trapped then pins and needles, pain or numbness may be felt in the hands. Neck strain can be a result of poor posture, muscle strain, sports or work injury. It can even be caused by an incorrect sleeping position. Babies can also suffer neck strain as part of the birthing process. Trauma to the neck is also very common, especially in car accidents, the speed of these type of injuries can lead to substantial tissue damage to ligaments and tendons in the neck. This form of neck strain can often take a long time to heal, causing pain, stiffness and a temporary loss of movement in the neck. 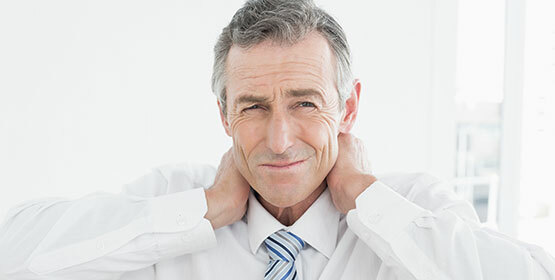 Successful treatments for even the most severe neck presentations are common place, but a key to success is starting treatment as soon as you can after the event. Osteopaths use a wide range of techniques for treating neck and shoulder pain including soft tissue, manipulation, mobilisation and exercise therapy. This allows osteopaths to treat a wide range of ages, from babies and children to the very old.